Everyone knows that exercise is good for them, with a range of health and emotional benefits, but did you know that certain types of exercise - specifically, strength-training - can have anti ageing benefits as well? Experts now agree that if you keep fit and do regular bouts of strength training will not only help fight the symptoms of ageing but may even reverse the effects as well. Research in the US and Canada is now showing that working out and keeping fit can not only make your muscles stronger but also younger too. Muscle tissue samples were taken from a group of healthy older women and men both before and after a 6 month programme using resistance training equipment found in a standard gym. These samples were compared against a group of healthy younger adults (20-35 years) with similar diet and exercise habits to the older group. Analysis showed that the older group’s muscles were actually rejuvenated, even at the cellular level of gene expression. In particular, their mitochondria – the cell structures which generate energy – had been restored to youthful levels of effectiveness and efficiency. Furthermore, after the period of strength training, the older group’s muscle strength had improved by approximately 50%. Interestingly, four months after the study, the participants of the older group no longer attended the gym but continued to do simple resistance exercises at home, such as lifting tin cans – and their muscle mass was found to remain the same! Thus exercise not only improves health but also seems to actually reverse the ageing process in itself. In our quest for an effective anti ageing solution, many of us are now wondering about the benefits of the new trend of “anti ageing clinics” that have sprung up, especially across the United States, where patients are injected with several hormones that are claimed to have anti ageing effects on the body. One of the most potent of these hormones is the human growth hormone, HGH. However, there is a much easier, cheaper and safer way to boost your levels of HGH without injecting artificial substances into your bloodstream. Strength training is a wonderful and effective natural way to raise your HGH levels – the more you work out and keep fit, the more HGH your body produces. In addition, strength training also helps to boost your bone mass density and reduce your risks of osteoporosis; it increases oxygenation of tissues and organs throughout your body and enhances your mood and brain function – all positive anti-ageing effects. And of course, it also helps you to maintain a healthy weight, increasing your lean body mass and reducing your body fat. Strength and resistance training has also been shown to be effective in fighting the chronic diseases that are often associated with increasing age. 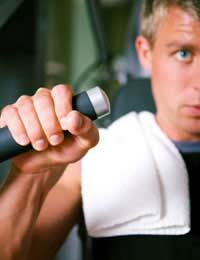 For example, with sufferers of Type 2 diabetes, their bodies become resistant to the effects of insulin, therefore causing their blood levels to soar – in this case, exercise and strength training helps to improve their sensitivity to insulin and therefore counteract the effects of the disease. Exercise is such an effective anti-ageing strategy because it has a profound effect on so many levels in the biological system, from cardiovascular to endocrine, immune to mental. So what’s a good exercise regime to follow for anti-ageing benefits? 2) 8 to 10 strength training exercises (each with 8-12 repetitions) twice a week. Don’t forget, if you are overweight, have been inactive for a long time, have a high risk of coronary heart disease or other chronic health problem, then make sure you see your doctor for an evaluation before starting any new physical activity programme.